Europe-Ireland-Dublin It is not often I put postcards up here featuring Paintings. 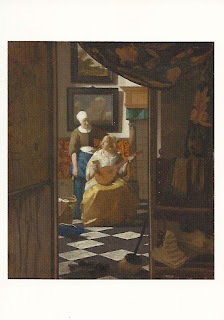 But in June I visited a marvellous exhibition at the National Gallery of Ireland It featured works by Vermeer the famous Dutch Painter from 1632-1675. 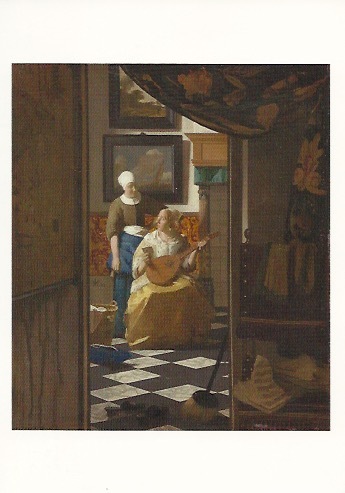 This one is one of the most famous "The Love Letter " circa 1669-70. These stamps feature Royal sites in Ireland. From a time when we had Kings of Ireland. The one of the left "Hill of Tara" , I can even remember from my school days. Europe-Ireland-Dublin Here is another and perhaps my favourite from the Exhibition. " Woman writing a letter with her Maid " circa 1670. 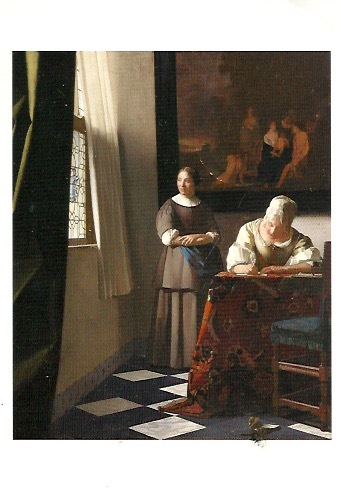 You will note that both feature letter writing well before we had postage stamps as we know them.